Well, every great story has to start somewhere, and this one is no different. This story starts here. 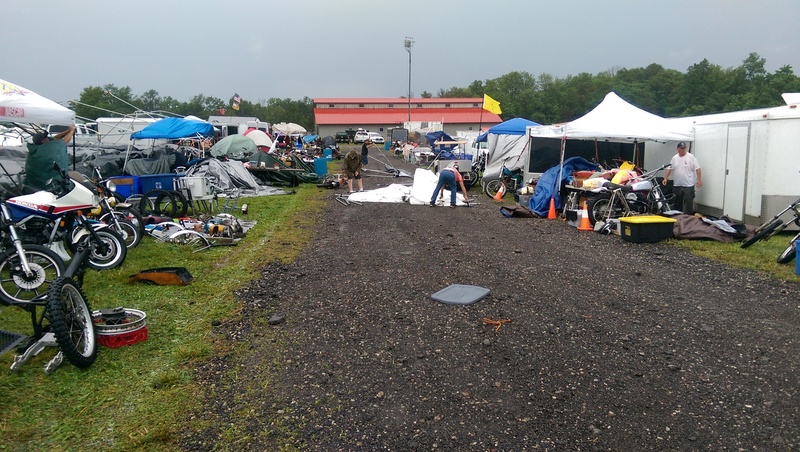 as one of the few surviving booths at the mid O swap meet on the morning the gods hurled all the leftover bad weather from the rest of the world on us, I was feeling lucky. I saw a majestic looking bike not far off and decided to look closer. 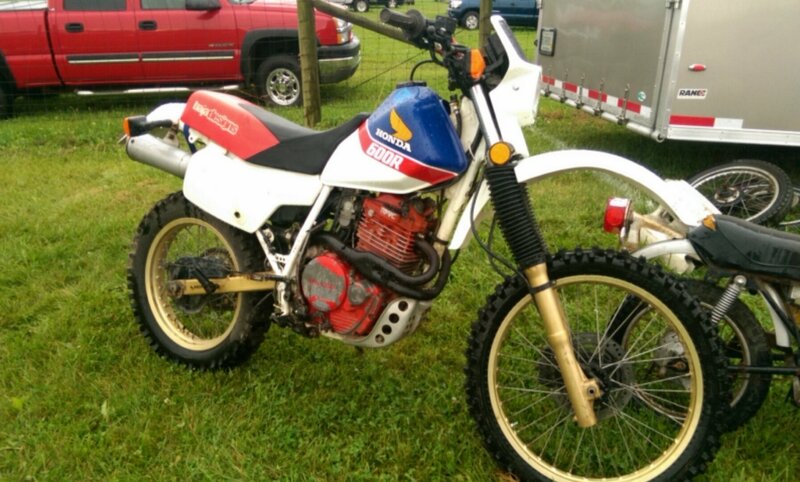 It was this 86 XL600R, and I loved it. I immediately heard Gary Wright performing Dream Weaver in the dismal skies above. The bike had also attracted a few others trying to buy it a drink or touch it inappropriately, but I seemed to be the only one asking about it. A short while later, I had tracked down the key and was told if i could start the damned thing, to take it for a test ride. Then to the surprise and jealous approval of all standing around (but shocking to myself), I started it flawlessly. I was off on the first date. I was hooked. I had to make this mine. I was short on cash from my sales so far, so I borrowed the balance from a shady character wearing a trash bag, and sealed the deal. As I was paying, another hungry crowd had gathered around it - probably after hearing the siren song from the Supertrapp riding around the swap meet. But it didn't matter, I held both the title and the key, so they were soon standing where a bike used to be after I had shockingly managed to start it flawlessly a second time. I got it back to our booth and immediately made bad choices to pay back the $ I owed the trash bag clad loan shark. So after humiliating myself for $ to some well known bike scrappers who showed interest in what I had, I cried, took a shower, got stitches, and paid my debt off. Sitting hurt for a bit tho. Didn't matter, she was mine. Next post I'll get serious and chronicle some of the bs I did over the summer with this bike, including looking for the mystery death rattle in the engine, replacing parts that didn't need to be replaced with parts from a different model but I made work, stupid mistakes, and current status of my subtle improvements to the bike to make it even better than perfect. Oh eh, a haha. Here we go. Nice read my man. Keep it interesting. This is stupid, and you still owe me interest on that 2 hr. loan, but I guess ill watch. And that trash bag poncho worked like a champ, until I Dutch ovened myself. next up, I forgot to mention before that probably the reason the bike was cheap enough for me to afford was probably due to the fact that it had a rather scary sounding death rattle coming from the motor. Top end, bottom end, not sure. I instantly thought it was the cam chain since they are obsolete and the tensioners are unobtanium. After I got home and used the raw horsepower delivery of the rear wheel to plow a garden, reroute a river, and clean out all the ditches, I took the motor out and went to exploring. I wasnt sure what I was looking for except that the cam tensioner and chain were probably worn out. So I bought '88 XR600 tensioners, chain, and drive gears. Since the '88+ XR600 part numbers were different, but really really close, I made sure to swap out the entire set of parts to ensure no odd parts remained. 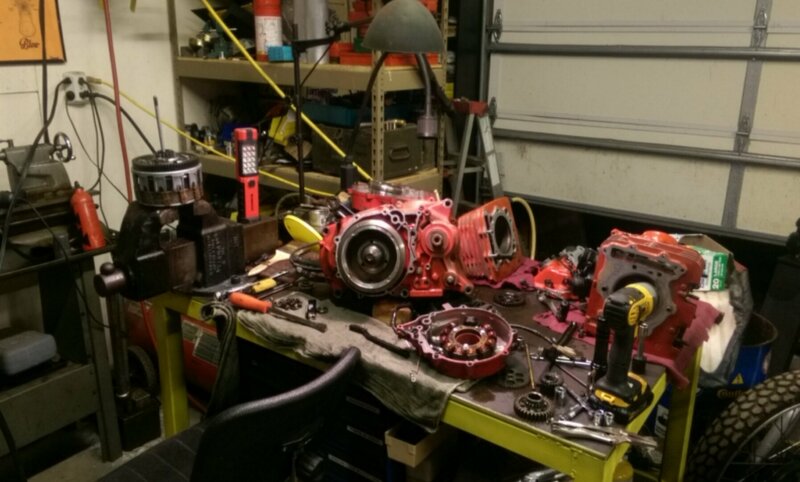 Put the motor back together after inspecting what I knew to inspect, and it still made the noise. Back out we go. On the second round, I was looking for anything that could be out of whack. I noticed the lower part of the auto-decomp mechanism was broken off and the pawl rattling around freely. Success. I turned a plug on the lathe, removed the sissy cable, pressed the plug in, and started to reassemble. When I put the cylinder back on, the old magnesium threads gave out. So... a pile of heli-coils later, Im back in business. At this time I had a ride coming up that was going to take 3 days, so I was getting eager to wrap this up. Back in the frame, bolted it all up, left the clutch out, back out, clutch in, back in the frame, etc. Fire it up. Still making the damned noise. 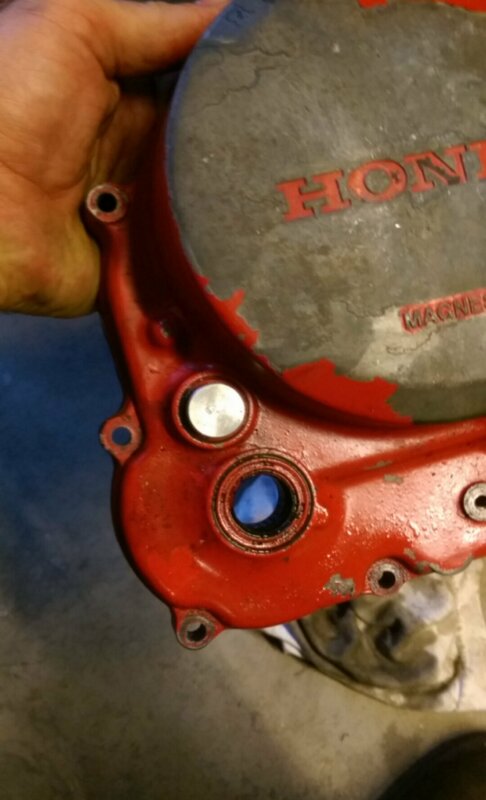 It sounded like something loose and rattling around in the front middle area of the motor. I could not diagnose the issue. Oh well, it hadnt died yet, may as well take it for a test ride. 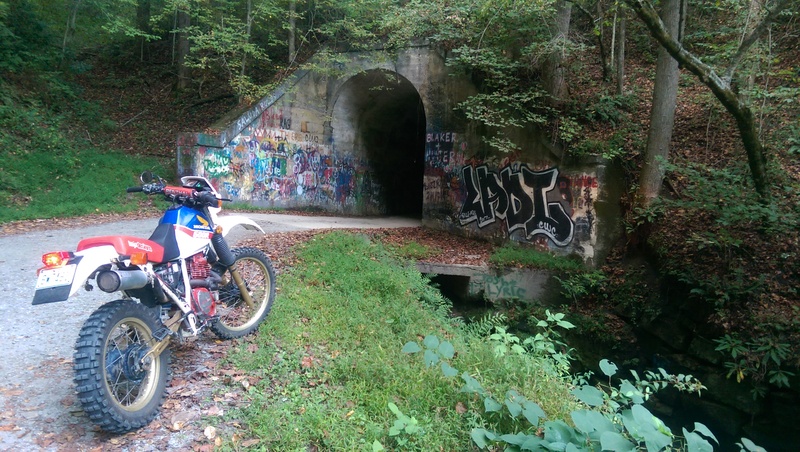 I'd found out back in the spring that there was a good little dirt road a few miles from home that went up the mountain to Saluda. So, it was this way that I went. 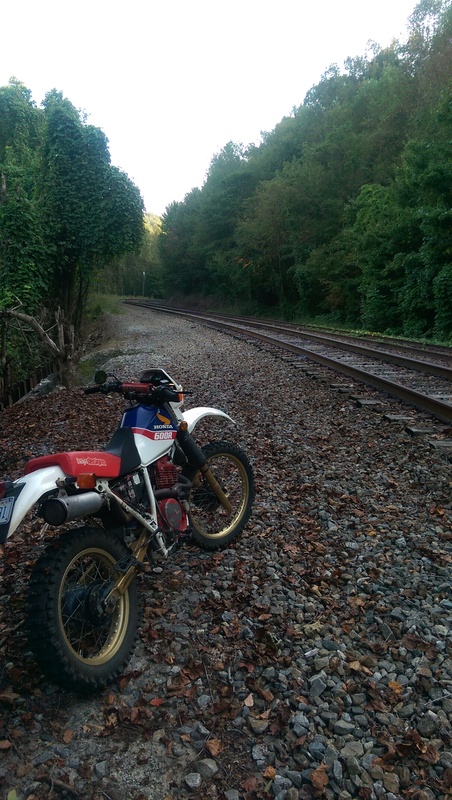 Once in Saluda, there's a little spot just out of town to slip off the dirt road onto the railroad tracks, and enjoy a blast back down the mountain to where the dirt road crosses under the tracks. So, the bike survived, no symptoms of anything going on in the motor except that noise. I prepped for the trip happening the next week. When the trip happened, I was meeting CCrider in the Harmon's Den area on the NC/TN border. We spent 3 days riding all the fire roads and dirt roads we could find in the area, and we hit gold. Miles of unpaved roads were available to ride, some in good condition, some were very rough. We loved the roughest roads and creek crossings. 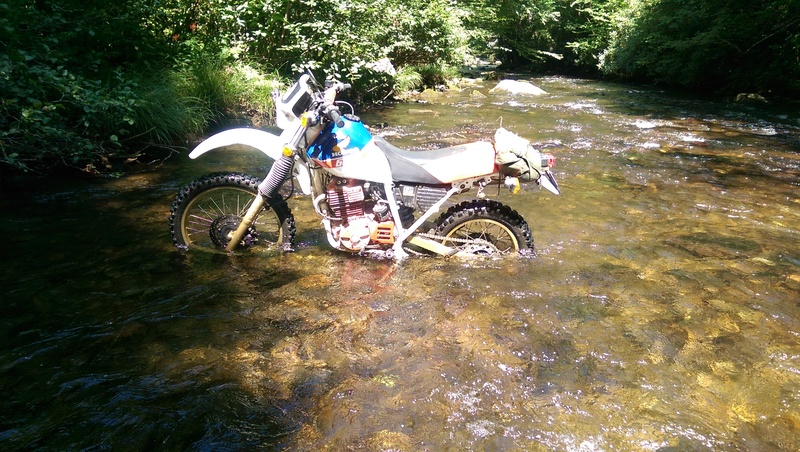 In one spot near cataloochie, I found a creek crossing that looked fun and long, but not technical at all. So we went for it. I was about 3/4 of the way across and had to fight to get that far. Turns out the creek bottom was very rocky and the rocks were large and algae covered. I lost it upon striking a very large rock, and fell over. I probably could have saved it except when i put my foot down the creek bottom was about 10" deeper than where the wheels were. Of well, I hadnt showered anyways. I pushed it on out of the creek and turned back to see Chris suffer close to the same fate. 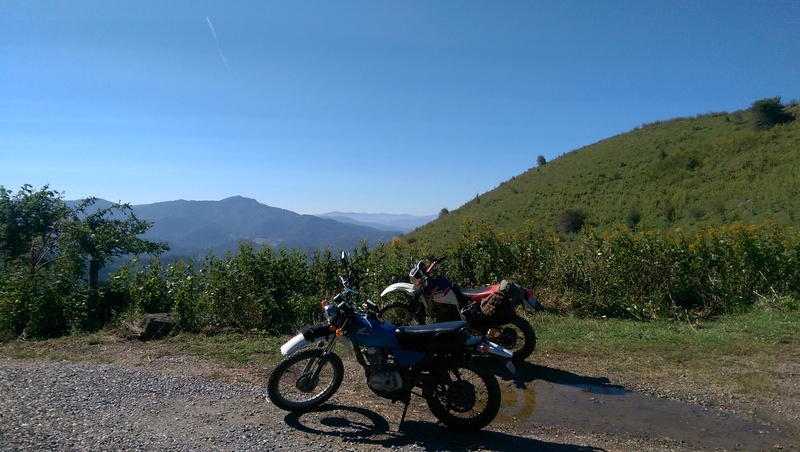 We worked for a bit to get our bikes started and then decided to head back across for more lunacy. We both got stuck again, and mine managed to get lodged perfectly upright. After the weekend, I had a couple things I wanted to consider changing on the bike. First of all, I loved knowing I could hit and maintain 75mph on the road, but 1st gear seemed a little too high for doing technical off-road climbing. 2nd gear is plenty strong enough for starting out, so if I were to swap out the 1st gear in the xl600 for a 1st gear from an xr600. I could maintain my upper gearing and gain a tractor gear for low end grunt. 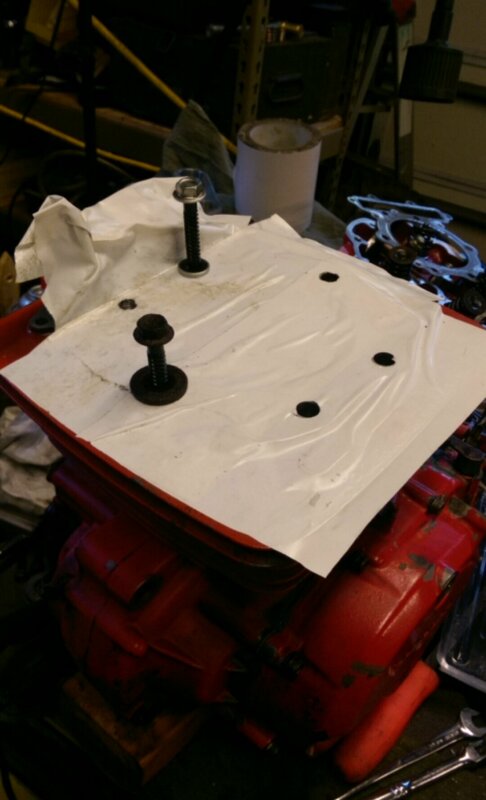 So I reached out to the shady character in the trash bag and soon secured an XR600 motor with a xl head, and another weirdo in Michigan had a xr bottom end that i got for something I have since forgot. We're up to October, btw. Come on E, it's been a few hours already, we want to hear more of the story!!!! This is rad!Just what I needed.